Trout has won two American League MVP awards and was the American League Rookie of the Year in 2012. Mike Trout and the Los Angeles Angels are close to finalizing a $432 million, 12-year contract that would shatter the record for the largest deal in North American sports history, a person familiar with the negotiations told The Associated Press. The deal was disclosed Tuesday by a person familiar with the negotiations who spoke to the AP on condition of anonymity because the agreement had not been finalized and had not been announced. The contract was likely to be announced by the end of this week, the person said. Trout's total would top the new $330 million, 12-year contract between Bryce Harper and the Philadelphia Phillies, and Trout's $36 million average annual value would surpass pitcher Zack Greinke's $34.4 million in a six-year deal with Arizona that started in 2016. The contract also would best Mexican boxer Canelo Alvarez's $356 million deal with sports-streaming service DAZN. Whether Trout's deal is the largest in the world for a team athlete is difficult to determine. Forbes estimated Lionel Messi earned $84 million from Barcelona in 2017-18 and Cristiano Ronaldo $61 million from Real Madrid, but precise details of their contracts are not known. While the marketplace has been slow for many players this offseason, prompting complaints from the players' association, top stars have gained robust deals. Four of the largest seven contracts will have been agreed to, with Trout and Harper joined by Manny Machado ($300 million for 10 years with San Diego) and Nolan Arenado ($260 million for eight years with Colorado). 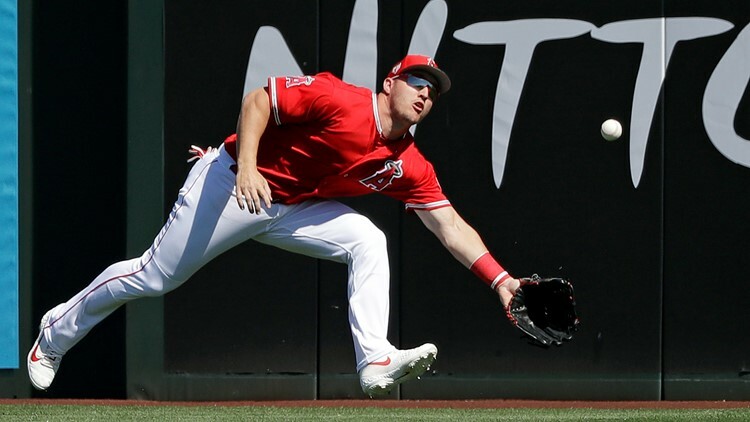 A 27-year-old outfielder entering what should be his prime years, Trout is considered baseball's top player and would have been coveted as a free agent after the 2020 season. He lives in southern New Jersey, and Harper said he was excited about trying to recruit Trout to join him in Philadelphia. Big-money deals have not worked out for the Angels in the past. Pujols agreed to a $240 million, 10-year deal before the 2012 season but has not matched his previous performance with St. Louis. Josh Hamilton signed a $125 million, five-year contract before the 2013 season and contributed just 31 homers and 123 RBIs in two seasons with the Angels.